A comprehensive package of further improvements to Range Rover models is unveiled at the British International Motor Show on October 18th. All models are fitted with a new chain drive transfer gearbox which gives quieter operation and also provides an easier and smoother change from high to low ratio. The new transfer box now includes a viscous control unit (VCU) which controls the centre differential automatically in slippery driving conditions. The VCU eliminates the need for the driver to lock the centre differential manually as the VCU performs this operation automatically the instant traction may be lost. The interior of the vehicle is further refined with new colour schemes, trims, door inners, improved radio/cassette system, and better heating and ventilation. For all models with the exception of the top-of-the-range Vogue SE, there are four new exterior colours and two new cloth seat materials. Other improvements include variable delay intermittent front wipers; heated front washer jets; new rear wash wipe programme; improved rear view mirror; and revised aerial in the rear windscreen offering improved radio recept. All models now feature a new Borg Warner transfer gearbox specifically designed for the Range Rover. The unit replaces the LT230 two-speed helical gearbox which was introduced in 1982. The new gearbox uses a Morse chain and sprocket drive system. Changing from high ratio to low ratio is smoother because a planetary gearset is used instead of a sliding sleeve gear change. The new box, which is assembled at Kenfig in South Wales, gives further refinement to all Range Rovers through quieter operation. A viscous control unit (VCU) is splined to the centre differential and automatically compensates for wheel slip under both on and off road conditions. The driver no longer has to decide when to engage or disengage the differential lock. The VCU consists of a sealed drum which contains multiple slotted discs alternately coupled to an input shaft hub and to the drum itself. The discs are arranged with a small clearance between each other and do not touch under normal conditions. The drum is filled with a special high viscosity silicone fluid. When loss of traction occurs the shearing action of the discs instantly transfers drive from the slipping wheels to those with grip. In extreme conditions, the temperature rises the viscosity increases and the discs engage with each other creating a locking effect within the VCU providing equal distribution to the two drive shafts. Immediately traction has been restored the VCU automatically disengages. On manual Range Rovers the gearbox enhancements include improved layshaft bearings, and a heavier balanced gear shift knob to provide easier gear changes. Four new exterior colours are introduced to the range. They are Cairngorm brown (micatallic); Trocadero red (micatallic); Eastnor green (solid); and Arran beige (solid). The new colours are added to the existing range of Caspian blue, Cypress green, Chamonix white, Colorado silver, Alaskan blue, Portofino red, and Shire blue. The new corporate identity "Land Rover" badge is fitted to the radiator grille of all models. The doors have all new casings with moulded-in armrests in both the front and rear. The front doors have a larger door pockets, new interior release handles, and flush-fit door lock buttons. The doors also have polished American walnut inserts. The facia, centre console and steering wheel/column shroud is in Bokhara colour chosen to match the Brogue cloth (brown) and Winchester cloth (grey) colours. All seat belts are Bokhara. The heating and ventilation is improved, and optional air conditioning units have an increased air flow from a quieter fan operation. The optional unit contains a new control setting to enable air conditioned air to be blended with the heated air. The Clarion radio/cassette, previously on the Vogue SE, is now available in all models with C.A.T.S. (Computer anti-theft system). The system has two speakers in the front and two in the rear. Radio reception is further improved through a new aerial in the rear windscreen. * Single touch descending action on driver's window. * Heated windshield washer jets. * Variable delay intermittent front wipers (from three to twenty seconds). * Screen-mounted rear view mirror. * Revised heated rear windscreen covering a larger area. * Upgraded central locking to include the tailgate. * New rear seat latches which are lighter to operate and easier to lock. The Range Rover Vogue SE, launched at Geneva Motor Show in March, is also further improved. It was launched with a number of standard features including automatic gearbox, air conditioning, electric sunroof, electrically-operated front seats, leather seats, colour-keyed alloy wheels. Now the Vogue SE, introduced only in Cypress green or Caspian blue, is available in Cairngorm brown or Beluga. And two new leather seat colours are introduced - Winchester and Sorrell. The vehicles carry a new Vogue SE badge on the tailgate. The facia is further refined by giving Burr Walnut treatment to the air conditioning rail, gear surround and electric window lift switch plate. The doors have Burr Walnut inserts and an additional bass speaker is added to the lower part of the front door. In the immediate post war years Rover was under strong government pressure to make cars in volume, especially for export. However steel was in short supply. During this time two brothers, Maurice and Spencer Wilks were Rovers' Chairman and Chief Engineer respectively. Maurice owned a farm and had bought an ex-US army jeep. Driving it on the farm quickly convinced him that Rover could build a better four-wheel drive machine, using the same basic engineering ideas. Thus the Land Rover was conceived as a short term stopgap model. It had to be simple to build, strong and easy to operate. I would be ideal for the farmer and the developing Third World. To overcome the steel shortage the body panels would be of aluminium. The first prototype had a central steering position eliminating the need for left or right hand drive models. Other prototypes had power take-offs and were secretly tested pulling ploughs, harrows and other farm implements. King George the sixth tested one at Sandringham and Balmoral and ordered the first of many for Royal Estates. Everyone wanted a Land Rover - farmers, foresters, police, armed forces. However the greatest demand came from Africa and other parts of the developing world. In those days Land Rover could go where no vehicle had gone before. Demand for the vehicle mushroomed. Agreements to build under licence were made with Belgium and Spain. At its height Land Rovers were being assembled in more than 30 countries from knock down or KD kits supplied from the UK. Over the years the Land Rover has been constantly refined and improved. The Series II arrived in 1958 and with it the 2.25 litre petrol engine. In 1971 the Series III 88" and 109" models were unveiled shortly after the completion of the 750.000th Land Rover. By 1979 customers had the option of the V8 petrol engine as fitted in Range Rover. The greatest advance, however came with the introduction of the Land Rover 90" and 110" models offering permanent 4 wheel drive and Range Rover derived helicoidal spring suspension. The four cylinder petrol and diesel engines were enlarged to 2.5 litres and mated to a five speed gearbox providing much improved on and off road performance. In 1986 a 2.5 litre turbo charged diesel engine was introduced offering over 28 per cent more torque and a 25 per cent increase in power over the naturally aspired version. For 1988 further improvements included black bumpers, a lighter grey interior and on county models a stereo radio cassette and sunhatch. Latest models for 1989 have improved exterior aesthetics with ribless roof panels and a rivet-tree upper body sides on all Hard Top and County models. All Pick-Up and Hard Top models also feature exterior body sides tapes in graduated silver. 1988 40th Anniversary of Land Rover. Over 1.6 million vehicles sold worldwide. Back in the early 1960's Land Rover engineers began looking at the possibility of a luxury station wagon with both on and off road capabilities. Such a vehicle needed a more powerful engine than any then available in the Rover range. By chance, Land Rover's then Managing Director spotted, and secured the rights to the ideal powerplant - a light aluminium alloy V8, offering tremendous low-down torque and impressive on road performance. The Range Rover made its debut in 1970 and was available in just one guise - a three door estate with four speed manual gearbox and permanent four wheel drive. Such was the Range Rover's uniqueness that one model was exhibited at the Louvre as an example of modern sculpture. However, despite its more luxurious image the emphasis was still on practicality - the original brochure extolled the virtues of a hoseable interior while the British Trans-Americas Expedition proved the new vehicle was every bit as tough as the Land Rover by crossing the Darien Gap in 1972. Over the years the choice of Range Rovers has been extended to meet public demand. A four door model was launched in 1981 and automatic transmission the following year. In 1983 a five speed manual gearbox was introduced. 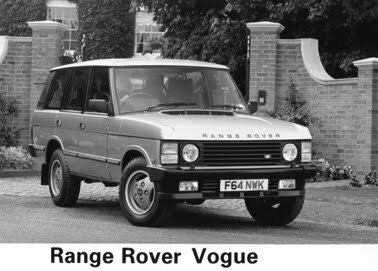 Two years later the Range Rover Vogue received fuel injection, and in April 1986 the Range Rover Turbo D made its debut. 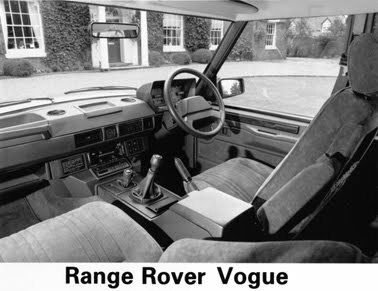 March 1988 saw the launch of Range Rover's new flagship the Vogue SE which features air-conditioning, 4 speed automatic transmission, Connolly hide upholstery and electric tilt and slide sunroof all as standard. 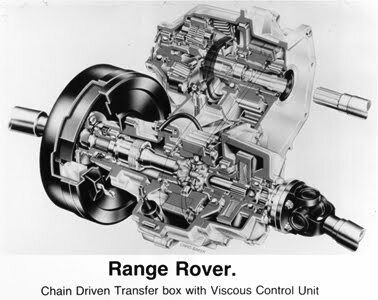 The latest Range Rovers, making their first appearance at the British International Motor Show, feature a new chain drive transfer box with a viscous control unit which locks the centre differential automatically when traction is lost.